Wheat (Triticum aestivum L.) is planted widely in South Africa under different production conditions. Seeding density is an important production factor and when managed optimally, can result in cost savings for the producer. A fine balance must be struck between costs/ha and the establishment of seedlings for optimal grain yields. Good yields and profitability can only be achieved through careful planning and management. Higher yields imply higher profits since production costs per ton of grain decline relatively as yields increase. Avoid having an inflexible approach to crop management. 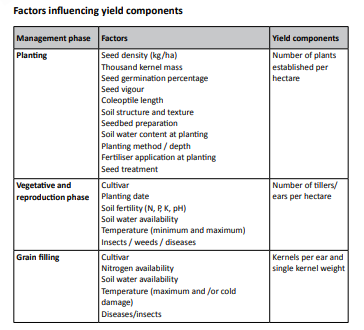 Above-mentioned yield components and eventually grain yield is determined during the three main development phases and relevant growth stages as indicated in the schematic representation (Figure 1, ARC, 2019). A yield component that develops at a later growth phase, can partially compensate for reductions in another yield component determined at an earlier development stage. The development stages for the different yield components overlap to some degree in their respective effect on potential grain yield, and they are determined in a definite sequence. Seeding density is important for the wheat crop since it directly affects the number of ears per unit area and other yield components such as the number of grains per ear and individual grain weight (Davidson and Chevalier, 1990; Lloveras et al., 2004; Ozturk et al., 2006). The ability of wheat to compensate for the lack or excess of a yield component through changes in the other components is essential for a cultivars’ best performance (Freeze and Bacon, 1990). Such compensation in the sink/source relationship of the plant can maximize the yield potential of wheat per unit area, depending on the genotype, the environment (climatic and growth conditions) and their interaction. However, reducing seeding rate when conditions are sub-optimal at planting or irrespective of the genetic make-up of the cultivar can be detrimental to grain yields. To start at the beginning – the germination percentage of seed planted for production is dictated by several laws to ensure viable seed germination and successful emergence. Cultivars are tested during development and initial field trials at different seeding densities. Due to the genetic makeup of the cultivar, it will be aimed at either rainfed or irrigated production systems. The main genetic difference between spring and winter wheat lies in the need of the winter types to be vernalized sufficiently (receive sufficient cold units during the early vegetative stages) to enable physiological development and switching to the reproductive growth stages. The lack of vernalization requirement in a winter cultivar can prevent the switch-over to the reproductive growth stages and results in a total yield loss. Differences in genetic tillering capacity and various other agronomic factors (fertilizer, planting depth and row widths) also play a role in the plant count to be successfully established for optimal yields. In dryland production systems the choice of planting date influences the seeding rate of the cultivar to be planted. Winter type cultivars are planted earlier in the season, to enable vernalization capacity to be realized with sufficient cold units accumulated during the early winter period. Generally, this enables the plant to initiate more tillers during this early part of the growth period. In turn, the more tillers that can be produced can lead to decreased seeding rates to use this characteristic to develop a sufficient number of surviving tillers to ensure optimal yields as determined by the climatic conditions. As the planting season progresses, less cold units are available for accumulation and therefore the risk of lack of vernalization occurs as well as less tillering. To ensure sufficient ears/m2 a higher seeding density must be planted. These agronomic details are measured with different planting date trials during cultivar development and are linked to grain yields during this planting spectrum in different climatic regions, and an optimal seeding density range is calculated for each cultivar. Under dryland conditions dry topsoil especially during later planting is circumvented by planting deeper into the soil after using furrow openers on the planter to move the dry soil ensuring seed/moist soil contact. Dry soil is replaced on top of the row to limit quick moisture loss via evaporation. This, in turn, increases the actual planting depth of the seed, and cultivars are selected and tested to have an extended coleoptile length of the seedling to ensure successful emergence. Seeding density must also compensate for potential loss of seedlings that do not successfully emerge or that are planted too deep during the planting process and fail to establish successfully. As for the effect of row width on the establishment, the winter cultivars are planted in a production system where residual soil water is of utmost importance for a significant part of the growing season, and also the probability of early spring and summer rainfall occurrence to support yield potential. Therefore, wider row widths of 30-45cm are general practice to balance water use and plant growth. This results in a planting density of 45-140 seeds/m2 to limit intra-row competition depending on the cultivar characteristics. The higher seeding density is for planting later in the planting window. Differential performances of cultivars regarding tiller formation and survival as well as the crop environment should be taken into account for achieving proper seed densities. In favourable environments, there is a uniform yield due to regular tiller formation and continuous distribution of photosynthesis products, which contribute to grain yield (Rickman et al., 1983). On the other hand, tiller development in stress conditions is irregular, forming a high rate of underdeveloped or weak tillers which compete with normal tillers and affect plant grain yields (Martin, 1987). Adjust seeding density to environmental (favourable or unfavourable) conditions. As for irrigation production, the genetic makeup of these spring wheat cultivars is usually quite different from the dryland genetic material. Under irrigation the grain yield potential is significantly higher, necessitating different genetic make-up of cultivars. Generally, spring types are planted, with plants not vernalization sensitive and with reduced tillering capacity. Spring wheat has reduced plant height (shorter straw lengths) to counter probable lodging of plants at higher yields, but this also reduces coleoptile length of the seedlings. However, these cultivars have reduced tillering capacity, shorter growing seasons and smaller vernalization requirements. These factors combine into higher recommended seeding densities to ensure optimal ears/m2, and an optimal sink/source relationship is established to support the higher potential yields. Row widths under irrigation are between 15 and 25cm with many hectares being broadcasted via spreaders as well. Optimal planting densities do vary in line with the length of growth period of cultivars, with the shorter growers needing higher densities to compensate for even more reduced tillering and the shortened growing season. Range is from 275-350 plants/m2 or ±100-130kg/ha (TKM-32g/1000 kernels, 90% establishment). 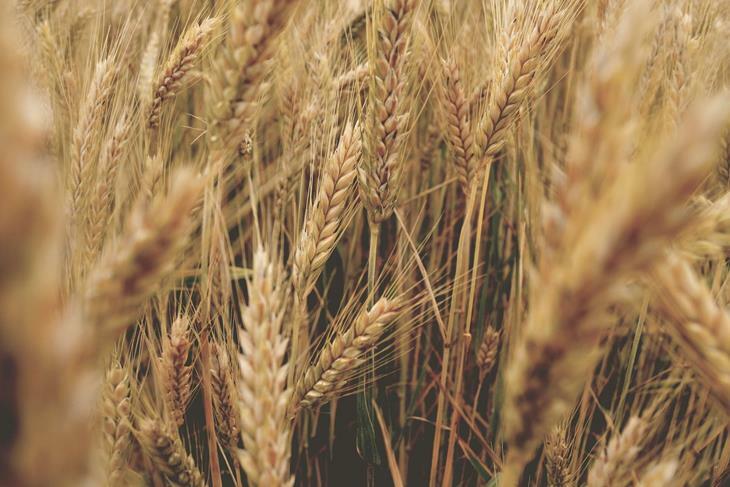 The production of wheat in the winter rainfall region in the Western and Southern Cape use cultivars with a different genetic make-up to thrive in the winter rainfall conditions. Cultivars have low vernalization requirements, high tillering capacity, and it is suited to narrower row widths. Because of the wet and humid conditions during the most part of the early growing season, disease resistance is of high importance. Due to soil type and planting conditions recommended seeding densities are 150-200 plants/m2 under rainfed and 200-250 plants/m2 under supplementary irrigation. This can be adjusted due to planting conditions, soil types, area as well as yield potential and cultivar characteristics. Optimum seeding density is constantly researched via seeding density trials in all areas. Higher densities are more suitable in higher rainfall years, although this cannot be determined at planting what the season would turn out to be. Planting densities with no-till planting methods in conservation tillage systems in most regions in the Western Cape, a minimum target planting density of 175-200 plants/m2 should be aimed for, and in areas like the Riversdale flats, this target can be reduced to 120-150 plants/m2 if planting is completed early. In low potential areas like the Napkei valley, 150-175 plants/m2 should be the target. The recommended seeding densities include a safety factor to ensure that in most conditions as close to optimal plant population is ensured. Lower seeding densities as planned must be increased if the soil water conditions at planting are not optimal. The use of seeding densities is linked to the recommendations for plant populations required per cultivar (plants/m2) and is adjusted according to the thousand kernel mass values per seed lot of a cultivar. Seeding density also compensated for lower seed viability that may occur, poorer emergence due to the planting conditions and the sub-optimal establishment of the plants. Thousand kernel mass is an important value indicating the number of kernels per kilogram seed, and this value can vary significantly, influencing the calculation of the seeding density in kg/ha for the target plant population/m2. Calculating the seeding rate for wheat plantings is influenced by the seed size or thousand kernel weight. The thousand kernel weight (TKM) and tested germination percentage of the seed batch are listed on the seed label of each bag of seed. The smaller and lighter the seeds are (lower TKM values), less seed (kg) is needed to reach the recommended plants/m2 recommendation. Establishment% of 80% is generally used. The effect of smaller seeds on germination, emergence and seedling vigour must also be considered. Although actual kg/ha can be reduced to reach similar seeds/ha in comparison to larger seeds (higher TKM), the final number of established plants can be lower because of poorer seedling growth if planting conditions are not optimal. The planting density can vary depending on the status of the seedbed, the planting date, irrigation method and the planter used. It is important to note that seedbed preparation plays a vital role where lower planting densities are used. The producer must be aware of the fact that the thousand kernel mass and the germination capacity of the seed can vary from year to year and that seeding density must be adjusted accordingly. Seeding rates for broadcast spreading and subsequent cultivation to cover the seed with soil must be higher (up to 30%) because of significant seed losses via birds as well as varying germination and emergence due to varying seed placement depth after cultivation. 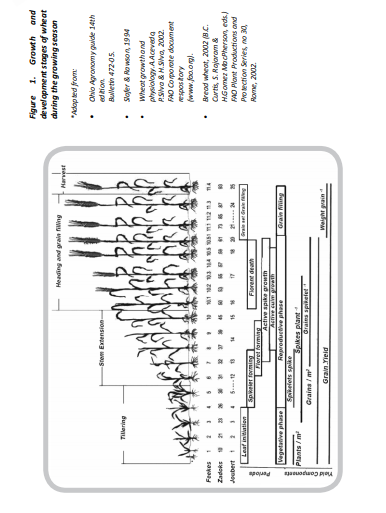 To summarize, the later wheat is planted in the planting spectrum for a specific cultivar, the higher the seeding density is to ensure that optimal yield potential as ears/m2 is developed. The more difficult the planting conditions that can affect germination and possibly emergence (soil water content, depth of planting, texture and structure), an upward adjustment must be made to compensate. Seeding density is an important production factor and when managed optimally, can result in cost savings for the producer. Lower seeding densities increase the risk of sub-optimal plant populations if external factors limit germination, emergence and establishment of the crop. When there is doubt about the soil conditions at planting keep to the recommended seeding densities for the respective cultivars. Learn to adapt and revise management strategies as the cropping environment, yield potential, commodity prices and input costs changes.